Wooster School on Miry Brook Road in, Danbury, Conn., is a pre-school through high school, private co-educational school. Wooster School is phasing out its lower school due to declining enrollment — but it’s not the only private school in the state to grapple with a shrinking student population. Private school enrollments and the number of independent schools in the state has dropped in recent years, in large part because of the decline in the birth rate and wealthy families leaving Connecticut. 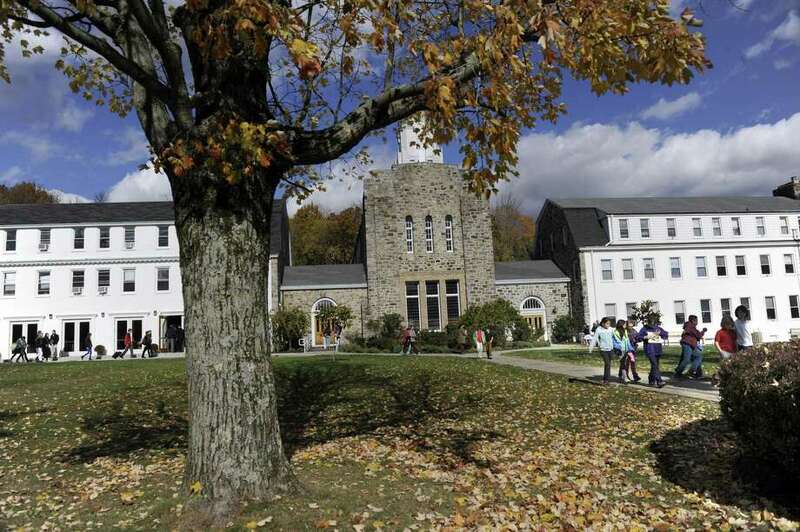 Danbury’s Wooster School cited a drop in the birth rate and the rising cost of college as reasons why lower school enrollment has faltered, while its middle and upper schools have flourished. “By all accounts, these economic and demographic realities aren’t going to change in coming decades and will continue to threaten the educational and financial viability of lower school divisions in independent schools,” Matt Byrnes, head of school, said in a statement. The lower school served kindergarten through fifth grade, but Wooster will only teach fifth through twelfth grade beginning in the 2021-22 school year. Wooster officials did not make themselves available to comment further on the decision or future plans. There are 46 independent schools in the state with about 17,900 students this school year, as compared to 57 schools and about 22,700 students in the 2006-07 school year, according to the Connecticut Association of Independent Schools. Blythe Everett, head of Marvelwood School, a boarding high school in Kent, attributes the decline to fewer young children and even fewer families who are able to afford private school tuition. Nearly half of the 939 independent schools examined in a national study lost students between 2006-07 to 2013-14, according to the National Association of Independent Schools. The rest grew in enrollment. Private schools in New York, New Jersey, the West and the Southwest are growing, while schools in the Mid-Atlantic region are losing students, according to the association. New England, Midwest and Southeast regions report a mix of enrollment growth and loss, the association said. The closing of Catholic schools has had a big impact on overall enrollment numbers because parochial schools make up a large chunk of the independent school sector, according to the association. Catholic schools have been struggling lately due to demographic changes, competition from public schools and a decrease in young families practicing their faith. Some Catholic schools in the state have closed, while others, such as St. Joseph’s in Brookfield, implemented a new teaching model to stay open. Several public schools in the Danbury area have also seen enrollment fall or remain steady in recent years, according to the state Department of Education. Meanwhile, Connecticut had the fifth lowest birth rate in the states in 2017, according to the Centers for Disease Control. Enrollment is still good at upper and middle schools, but sometimes flounders at lower schools. Still, educators said it is normal for lower schools to be smaller. Some parents elect to save money when their kids are younger by sending them to public school, said Douglas Lyons, executive director of Connecticut Association of Independent Schools. “You don’t want to start in kindergarten and not be able to finish,” he said. But sending kids to private school when they are younger can give them an advantage, Lyons maintained. That’s why he is paying to send his four elementary-age grandchildren to private schools. If they need to go to a state college later, that’s O.K., he said. Distance is another factor. Parents are less likely to send their kids farther away for elementary school, than for middle or high school. “Parents are not likely to drive 45 minutes each way for second grade,” Lyons said. Lyons said the economy has had one of the biggest impacts on private schools in some parts of the state. As businesses leave the state and take wealthier executives with them, private school enrollment drops, he said. This was the case when General Electric left Fairfield, and especially true when Pfizer left New London, he said. Still, he said Fairfield County has maintained enrollment better than other parts of the state. “There seems to be a fairly steady demand even in the leaner times,” Lyons said. But slow growth in average incomes in West Hartford has hurt private school enrollment in that area, he said. Janet Izzo, director of admissions at Hamden Hall Country Day School, said the school has seen an increase in applications in recent years as New Haven becomes more vibrant. The school even added a pre-school program a few years ago because of parent interest, she said. More than 575 students attend Hamden Hall, according to its website. Enrollment at boarding schools in northern Connecticut and nationally is still holding strong, thanks in part to international students. Lyons said there is a growing desire among Asian families, in particular, to send their children to high school in America because they believe it will help their kids get into an American college. Rumsey Hall School in Washington, which offers day and boarding programs for kindergarten through ninth grade, is among the thriving schools. “In no way do I think the private school model is getting kind of lost in the jumble of things,” said Ben Tuff, director of admission. Rumsey Hall has around 330 students, with children on the waiting list. Of that, 145 students attend the boarding school—the highest its ever been because of international students. This would help make up for any loss in revenue if the day school enrollment dipped, he said. In the bordering town of Kent, Marvelwood has 135 high school students—a number Everett said she is satisfied with. Seven to eight years ago, the school had its highest enrollment of about 165 students, but that was too many, she said. “We would probably like to be a little higher than 135, but we’re comfortable right now,” she said. Most Marvelwood students come from Connecticut, Massachusetts and New York, but some hale from 15 other states and 12 foreign countries, including Vietnam, China and Mexico. Schools are boosting marketing and upgrading facilities and programs to attract students. Marvelwood School recently introduced an equestrian program and renovated its dorms for $2 million, Everett said. King School in Stamford has increased its online marketing, said Nina Newman, director of admission. But the school, where enrollment is growing in the middle and upper programs and staying steady in the lower school, also relies on word-of-mouth. “We are lucky to have a strong lower school program that our families love and a community that supports our lower school program,” Newman said. Rumsey Hall doesn’t need to do much advertising, Tuff said. Tuff said schools often blame demographics for shrinking enrollment, but in Rumsey Hall’s case it doesn’t matter. He said students come from Miami or San Francisco or move from New York to live full-time in their families’ weekend homes in the Washington area. “Even though the demographics might not support the private school learning, sometimes you just have to think outside the box,” Tuff said.